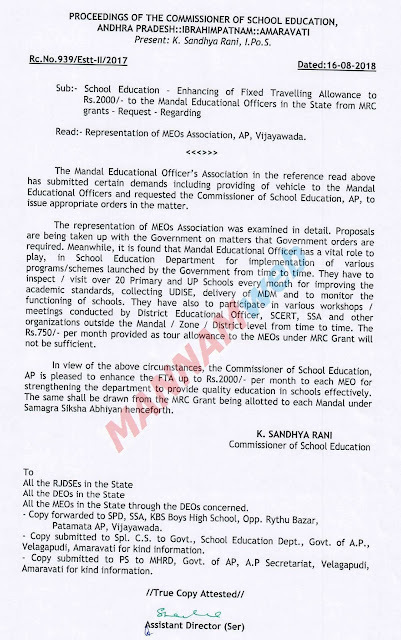 The Mandal Educational Officer's Association in the reference read above has submitted certain demands including providing of vehicle to the Mandal Educational Officers and requested the Commissioner of School Education, AP, to issue appropriate orders in the matter. The representation of MEOs Association was examined in detail. Proposals are being taken up with the Government on matters that Government orders are required. Meanwhile, it is found that Mandal Educational Officer has a vital role to play, in School Education Department for implementation of various programs/schemes launched by the Government from time to time. They have to inspect I visit over 20 Primary and UP Schools every month for improving the academic standards, collecting UDISE, delivery of MOM and to monitor the functioning of schools. They have also to participate in various workshops I meetings conducted by District Educational Officer, SCERT, SSA and other organizations outside the Mandal I Zone I District level from time to time. The Rs. 750/- per month provided as tour allowance to the MEOs under MRC Grant will not be sufficient. 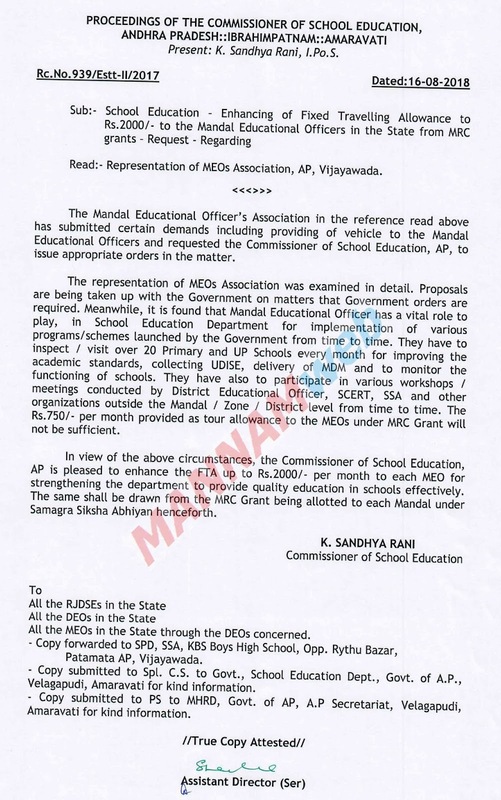 In view of the above circumstances, the Commissioner of School Education, AP is pleased to enhance the FTA up to Rs.2000/- per month to each MEO for strengthening the department to provide quality education in schools effectively. The same shall be drawn from the MRC Grant being allotted to each Mandal under SamagraSiksha Abhiyan henceforth.